Shop Home > Crazy Deals > Solstice Bali 11' Inflatable Stand Up Paddleboard "Free Shipping"
Solstice Bali 11' Inflatable Stand Up Paddleboard "Free Shipping"
The Solstice Bali Inflatable Stand-Up Paddleboard is the perfect means for beginners to take up stand up paddling to build their stamina and balance. With a core made from high-pressure, drop-stitched material, the board is strong and rigid. This 12-15 psi (0.83 to 1.0 bars) inflatable SUP board features a multi-layer construction that reduces flex on the board and can withstand enormous force to help you balance while you surf-paddle. There is extensive EVA non-slip traction top for maximum grip and comfort while riding out the waves. Made from durable 1000-Denier 3-Ply PVC material, the product will last long while remaining in perfect condition. Four stainless steel tie-down points are provided for securing gear on the board. This inflatable board comes with an HP pump with gauge, carry bag for easy use and storage, owner's manual and repair kit. 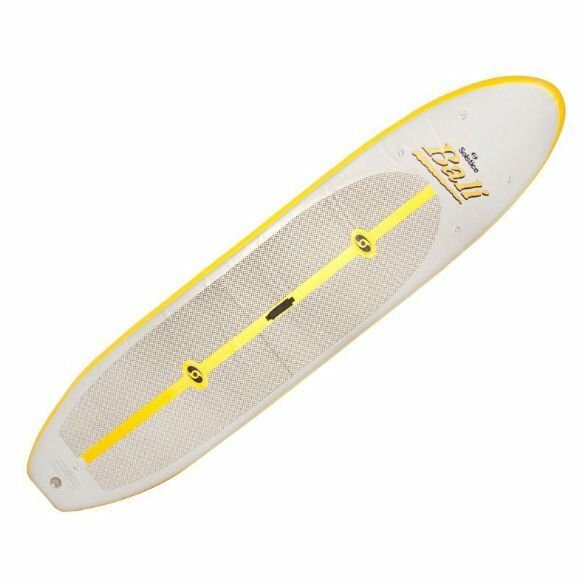 The Solstice Bali Inflatable Stand-Up Paddleboard can be the ideal surf board for amateurs starting out on the water. Board measures (L x H) 128" x 4" (325 cm x 10 cm) and has a maximum weight capacity of 250 lbs. (113 kg).